Enjoy different landscapes of the High Atlas from North to South. This trip is the best choice to discover the High Atlas and Mgoun mountains. We start from the amazing place of Happy Valley, then we climb Mgoun summit (4068 m) where we stay in an isolated campsite and have an opportunity to be amazed of the varied colours of scenery and wilderness of the flora and fauna. As we continue we also have the chance to experience authentic Berber villages and kasbahs in Roses Valley and dance and drum with local people. The trip ends in Marrakech, where we will have opportunity to visit the most famous places of the ‘Red city’: get lost in the labyrinthine narrow streets or souks and enjoy the atmosphere of the most famous Moroccan square, the Djemaa el-Fna. We cross the lowlands of Haouz plain towards Azilal town. Through Aghbar pass (2100 m) we get into Central High Atlas in Ait Bougmez Valley (Happy Valley), where we meet our muleteers and start trekking up Arous Valley. We camp in Ikiss n’Arous (2350 m) for the night. From our camp we continue climbing through a magnificent landscape. After three to four hours of steady climbing we arrive at the pass of Tizi n’Oumskiyk (3200 m) with a tremendous view on the Mgoun peaks. Later we walk down to the summer grazing pastures of the Tarkeddit Plateau (2900 m). Today’s walk is in the South face of Mgoun with varied landscape. In our way to Ameskar (1900 m) we meet many nomads from Ait Atta tribe who spend spring and summer in Mgoun massif. In the morning we descend the valley through the gorges of Assif Qati. Gradually the valley becomes wide and the villages are big with scattered grand kasbahs, like Agouti and Lhout. We have a beautiful walk in the roses fields till we get the amazing Boutghrar village (1450 m) where we spend the night. 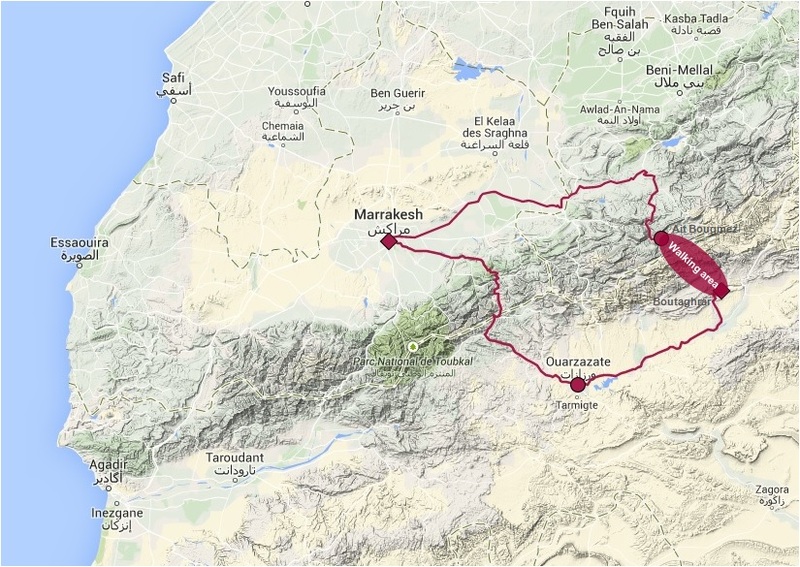 We drive back to Marrakech, via Ouarzazate and crossing the High Atlas Mountains through a snaky road of Tichka pass (2260 m) and then descending on the North face of High Atlas in wide Haouz plain where Marrakech is situated. We have enough time in Marrakech to sample some sights and sounds of the ‘Red city’ like the medina, the souqs, the Koutoubia Mosque or the Koranic School. We can finish the day in the well-known open-air central square, the Djemaa el-Fna famous for its food stalls, snake charmers, water-sellers and acrobats. In the beginning and end of the season (i.e. May and September) there can be still snow in some places in the mountains and therefore we might need to modify the program and/or itinerary of the trip. In the campsites we have two-person Igloo tents (with mattress) and shared facilities (toilet tent), but no shower is available.